Even more Ubuntu 11.04 Natty Narwhal customization tips. We have seen some of the most beautiful themes for Ubuntu 11.04 Unity desktop already and one of the highlights of that list was Nautilus Elementary Ambiance Theme. We think we have just found out an icons theme that gels pretty well with Nautilus Elementary Ambiance Theme and it's called Clarity. How to Install Nautilus Elementary Ambiance Theme in Ubuntu 11.04 Natty Narwhal? You need to have Nautilus-Elementary installed already of course. Now, install Nautilus Elementary Ambiance Theme by following the instructions below. We are simply quoting our previous article on this topic. How to Install Clarity Icons Theme in Ubuntu 11.04 Natty Narwhal? 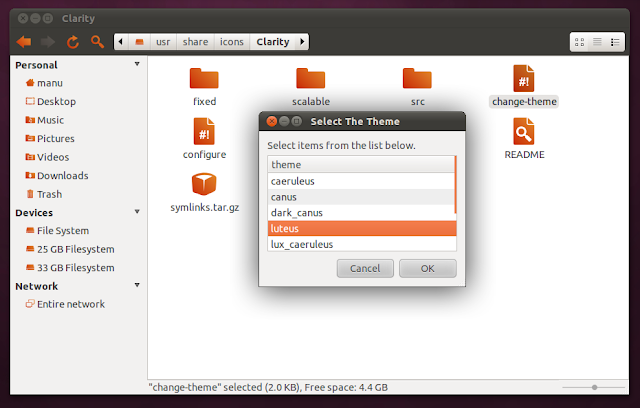 Clarity Icons Theme PPA is not available for Ubuntu 11.04 at the moment. If you are a Ubuntu 10.10 user, see how to install Clarity Icons Theme using PPA. Luckily, there is a Clarity Icons Theme DEB package available for download. Download Clarity DEB Package and double click to install it. How to Enable Orange Flavored Clarity Icons? There are a few more things to do. By default, Clarity Icons Theme has a grey color scheme. But it has got configuration options which are rather easy to do. Open Nautilus as root. Hit Alt+F2 and type the following. Enter password when prompted. You will now have access to Nautilus as root. Browse to /usr/share/icons and select Clarity folder. Double click on the file called 'change-theme'(without quotes) and click RUN. As shown in screenshot, select luteus color scheme. Now, reapply the theme(select a different theme first and then reselect Ambiance + Clarity combination once again). Changes will be enabled automatically. 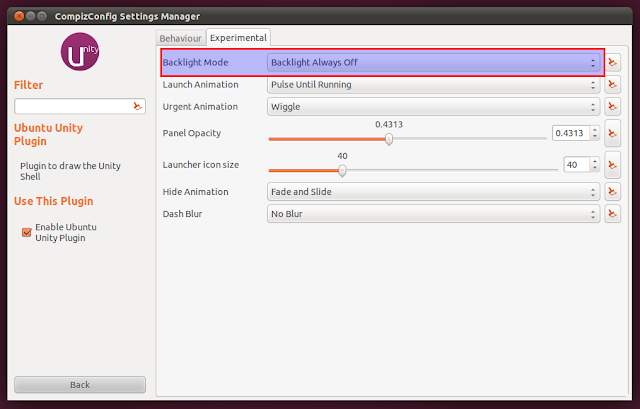 Open CCSM(CompizConfig Settings Manger) and browse to Desktop - Ubuntu Unity Plugin - Experimental Tab. And change Backlight Mode from Backlight Always On to Backlight Always Off. Nautilus Elementary Ambiance theme + Clarity Icons theme may not be the perfect theme combination for many, especially for those who don't like the default orange color scheme of Ubuntu. 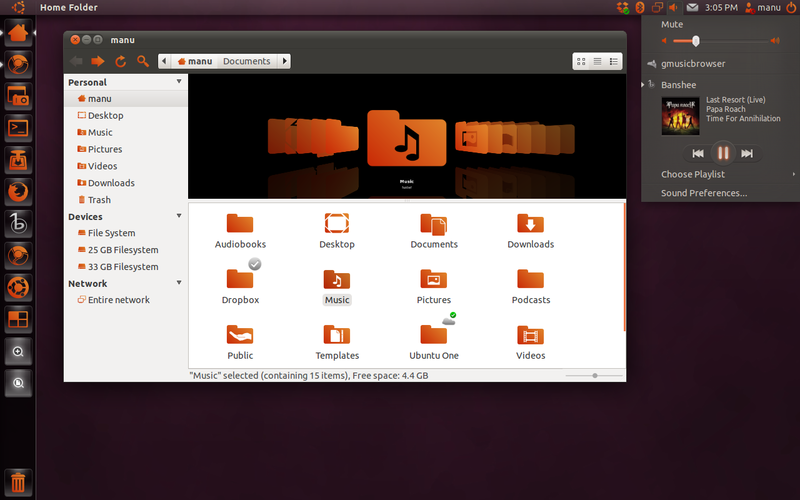 But I like it very much and for me, this is the perfect orange flavored theme for Ubuntu 11.04 Natty Narwhal. Let us know your opinion on this. Interested in more customization tips? Here are some of the things I did after installing Ubuntu 11.04. Thanks for reading.